An interesting evening of French music which brought together the London Symphony Orchestra and the London Philharmonic Choir in full force. When he was with the BBC Symphony Orchestra, Pierre Boulez transformed our perceptions of the Debussy & Ravel orchestral music, and he has recorded Daphnis & Chloé at least twice, with the NYPO and, more recently, the Berlin Philharmonic (DG 447 057-2GH). Following an unhappy experience of Daphnis & Chloe in St Sebastian , confidence in this grandiose ballet score on a slender Grecian pastoral (for a larger orchestra than any other commissioned work for dance) was entirely restored by Boulez's overall grasp of its large scale form, and firm yet flexible control of the thoroughly rehearsed orchestra. The LSO played as one, feeling the ebb and flow, with every detail emerging perfectly (the flute at dawn, played by one of the joint principals - both named Davies - was delicious). I have not always been convinced previously that the wordless choral involvement warranted a night out for the singers (the orchestral suites are generally given without voices) but this time they were integrated perfectly and their numbers contributed to the right feeling at climaxes, where they were not overwhelmed by the orchestra under Boulez's fastidious ear for sonority and balance. One of those performances, which for its duration wipes out all comparisons and will remain a treasured memory. Before the interval I had reservations. Cecilia Bartoli appeared to be still feeling her way into the tricky Berlioz song cycle (originally intended for sharing between mezzo-soprano, contralto, tenor and baritone voices), continually referring to the score which, unusually for her, she held in her hands. Musical line took precedence over clarity of words; we too needed to keep our eyes on the texts supplied (mercifully, we had not been plunged into darkness!). Quite short phrases were broken with her characteristic intrusive aspiration of breath, which first worried us in Zurich and seems to be an ongoing problem. Her tone could charitably be described as 'husky' and AW likes it. Bartoli's appearances ensured sell-outs for the two performances and following Les nuits d'été she obliged her predictably ecstatic audience with Zaide plus castanets. 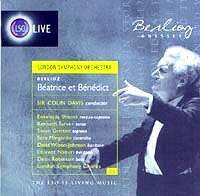 The Berlioz overture had been distinctly cooler under Boulez than recently with the same orchestra under Sir Colin Davis, and I confirmed this impression by playing at breakfast his warmer, more impulsive and involving performance of it from their LSO Live concert recording of all the music in the opera Beatrice & Benedict, superbly captured on the LSO's bargain disc which is complete with full words and translations for well under a tenner! This LSO Live label is a triumphant success, and for people not in London far cheaper than fares + tickets. The engineer Tony Faulkner explained to Seen&Heard the LSO Live recording philosophy of using 'as few microphones as is practicable to try to capture concert atmosphere without the boring obsessive so-called detail of many digital-age orchestral studio recordings' and he achieves excellent balance between singers and orchestra and a convincing representation of the experience from good seats in the auditorium. La damnation de Faust has received a lot of attention recently in S&H in DVD and staged performance in Zurich. 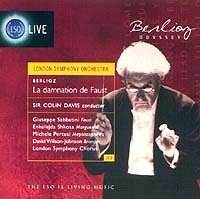 Sir Colin Davis' 15 & 17 June 2000 Berlioz Odyssey performances at the Barbican are conflated and released in a most desirable 2-CD boxed set on LSO 008 CD. Settled down at home, with no visual distraction, this was persuasive listening, and I quickly abandoned critical reflection and comparisons with other versions. At £10 including full texts and translations, with synopsis and an authoritative essay by David Cairns, another unmissable bargain.